We're proud to announce that Sacramento comic book creator Neil Riehle is providing us with a Free Comic Book Day mini-comic to introduce his new book, The Remainz. The FCBD edition of "The Remainz: Head Hunters" is in limited supply and will be available on Saturday, May 4, while supplies last. 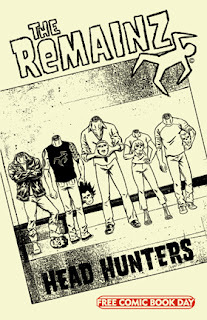 The Remainz shares the comedic adventures of a band of zombies -- no, not like a tribe of zombies, but a musical group. For more from Neil Riehle, visit his Wallop Comics Facebook page or The Remainz website.